Mr. Angel Gurría, Secretary-General of the OECD, was in Berlin on 11 March 2015 at the invitation of Mrs. Angela Merkel, Chancellor of Germany, to attend an event with the Heads of the International Monetary Fund, the World Bank, the World Trade Organization and the International Labour Organisation. The Secretary-General also attended the G7 Stakeholder Conference, hosted by Mr. Gerd Müller, Federal Minister for Economic Cooperation and Development and Ms. Andrea Nahles, Federal Minister of Labour and Social Affairs, and deliver remarks at a panel on “promoting decent work worldwide through sustainable supply chains”. 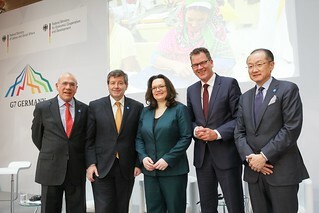 (From left) Angel Gurría, Secretary-General of the OECD; Guy Ryder, Director General of the International Labour Organisation (ILO), Andrea Nahles, Federal Minister of Labour and Social Affairs of Germany; Gerd Müller, Federal Minister for Economic Cooperation and Developmen of Germany and Jim Yong Kim, President of the World Bank at the G7 Stakeholder Conference. Berlin, Germany.